Creating a conference room that incorporates both technology and style for those important meetings can be critical to your success. Conference rooms with all the necessities will assist the presenter and keep the audience relaxed and attentive. 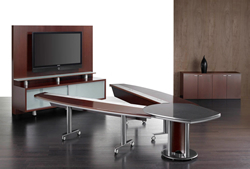 Comfortable ergonomic seating, visual boards for communication, power/data options on conference tables, and lecterns can complete a functional conferencing setting. Remember the need to store expensive equipment or catering materials can be accommodated with the various options of conference and buffet credenzas. Our trained staff can recommend the best arrangement for your business, whether you desire traditional or contemporary styling.